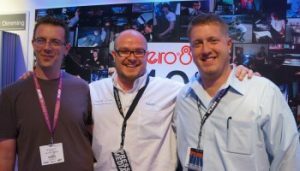 2017 is the year of On Stage Lighting’s 10th birthday and I’ve got some big news, plus some interesting snippets of the OSL story. 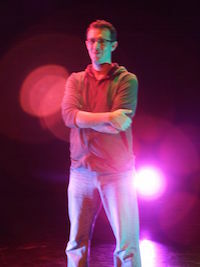 In 2007, a tiny unknown blog began under the title of On Stage Lighting. 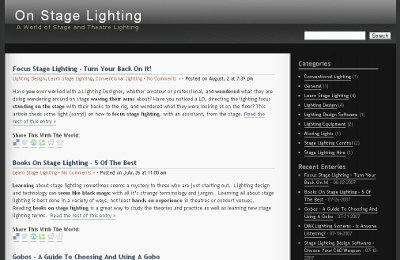 The site used a crappy free WordPress theme and carried a few articles on basic stage lighting concepts, the content of which was designed to capture a readership through a focus of commonly searched for stage lighting terms. The site was born into the blogging boom of the 2000’s where individual publishers were leading the way in providing high quality, free to read, specialist content. There were a few stage lighting related blogs and the mainstream industry publishers came along later. The site became pretty successful and soon graduated to it’s own look and feel – not dissimilar to the one you see today. I was an experienced freelance lampie when I started On Stage Lighting and wrote all of the initial content of the site with a plan to include the writing of other lighting professionals. As it turned out, the site became more about passing on my own lighting knowledge and was really the start of my journey into the field of education. A lot of the stuff published at On Stage Lighting was not available anywhere else and still continues to hold its value for many, judging by the number of visitors and the continuing positive contacts that I receive. This extended into other channels, most notably YouTube. Developing a following between 2007 and 2011, OSL grew to become a world recognised brand in our industry. It also helped me to meet all manner of interesting people such as fellow stage lighting writers Jim and Justin pictured below, and the epic Richard Cadena who wrote this for us. 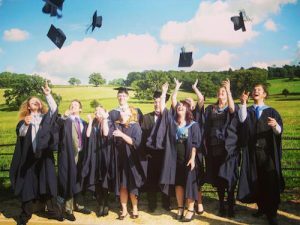 The site played at least some part in securing a role as Lecturer within what was then relatively unknown Theatre Production course at Bath Spa University. There was even a post about it around the time of OSL’s third birthday. This gig developed my teaching practice in subjects of lighting, sound and AV for performance, as well enabling me to gain formal teaching qualifications and professional recognition. During this time, the original readership of OSL learners also made their own way in the world of pro lighting and I’m proud to see that many of them have risen up to achieve great things. And, of course, so have many of my own graduates. When the bottom dropped out of the publishing model, On Stage Lighting started to shift away from the public facing free content and towards an educational offer that happened behind the scenes at Learn@OnStageLighting. Fewer public posts were going out, RSS feed reading was going out of fashion and the feed subscriber count was knocked sideways by the death of Google Reader. Anyway, social media was starting to be the main thing. Facebook interaction was replacing long form content reading and Facebook Groups are now at the centre of worldwide learning in stage lighting. Much of On Stage Lighting was now happening ‘backstage’. Meanwhile, being in a full time teaching role was making it harder for me to continue in my own cutting-edge professional practice. In our business, significant time away from very latest in professional techniques gradually starts to eat into your currency as an educator. No matter how much you keep up with this stuff on the side and through work with students, it’s not the same as practicing day in, day out. I’m not gonna bore with all that I’ve achieved in 7 years since starting the gig at Bath Spa University, so I’ll just say that it has been hugely significant and I’m really proud of what we’ve achieved in that time and this is shown by the growth and success of the programme. It’s now the right time to move on. I will maintain a teaching connection with the institution but am stepping way from the full-time grind of being a Senior Lecturer, which allow me to spend more time on other projects – both known and unknown! The known projects include On Stage Lighting and Learn@OnStageLighting, both of which I’ve not been able to give as much time to as I would like. I’m also continuing to be a External Examiner and advisor to other programmes, plus running my education consultancy business in the fast-developing world of production learning. 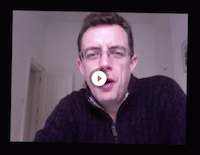 I’ll also be ’teaching teachers’, continuing a lot of the work that I’ve done to help production educators both directly and through my various learning content channels. Finally, I am going to spend time back in the production industry and continue in professional practice as a Lighting Designer and Programmer. This will ensure currency within my subject areas, particularly modern lighting / visual design and related professional practices. On Stage Lighting will benefit from this move to a certain extent, but a lot of the big stuff will be happening ‘backstage’ at Learn@OnStageLighting. 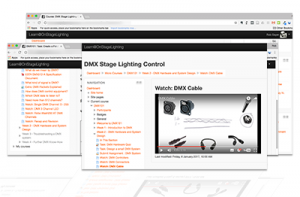 This includes at least one more cohort of the successful DMX Lighting Systems course in 2017, plus the Lighting Designer Startup and Busking Lighting Techniques courses too. We have a whole new ‘generation’ of budding lampies to help and this help includes the free beta of the basic terminology web app that many beginners have found useful. If you haven’t already, make sure that you are on the Learn@OnStageLighting Guest List as that’s where at lot of stuff will be happening. You can do this quickly in the box below, or go to Learn@OnStageLighting for a more detailed signup. As for the unknown projects….. Well… if you know of anything that I’d be interested in joining that relate to lighting and/or education, then get in touch in the usual ways. I’ve got plenty lined up but would still like to hear about stuff that I could bring my unique set of talents too. So, Happy Birthday to On Stage Lighting and let’s look forward to the next phase. Both stage lighting and learning looked very different 10 years ago. Hell, it looked different 5 years ago. I’m looking to the future, who’s with me? P.S. If you wanna help celebrate our 10th year, give this post a 10th birthday share on your favourite stage lighting Facebook group and tag me in (https://www.facebook.com/robsayer) – it’s pretty much like a sending a birthday card. Congratulations on 10 years of quality blogging. You’re my go-to guy on all things stage lighting. Hey. I was just gonna say the same about you! Cheers.